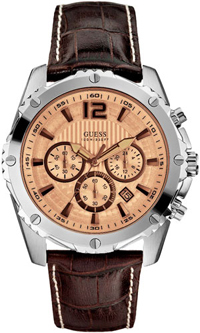 Guess Watches launches a collection of 'Spring-Summer 2013 "exclusively at 15 outlets in Russia.Guess brand is ready to present his fans new watch collection "Spring-Summer 2013." Guess brand is ready to present his fans new watch collection “Spring-Summer 2013.” The first new buyers will see the best 15-hour stores in different cities of Russia. Starting the collection will take place on February 15. Unconditional trend new collection – pink gold. It is impossible to deny that it must have the coming season. A soft shade of rose gold can be seen almost everywhere in clothes and accessories – from shoes to handbags. A bright and stylish new collection is a lot of different models. Some of them are fully implemented in line with the main trend – rose gold, in others this shade presented as separate items on the bracelet in silver, in the third it is combined with dark skin and is converted to a truly masculine copper hue. From 15 to 17 February, Guess watches offer first buyers of a new collection of special nice gifts, and on March 1 the new collection will go to all points of Guess in Russia.